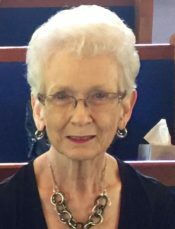 Carol Lynne Vanderhoff, age 77 of Cantonment, Florida passed away Thursday, April 4, 2019. She was born July 12, 1941 in Rockford, Illinois to Wendell William Hoel and Doris Pauline Buckles Hoel. Lynne was a devout and active member of The First Christian Church Pensacola (Disciples of Christ). After retiring as an insurance claims representative at Lakeview Center she enjoyed spending time working in her yard, outings with the Red Hats Society, taking care of others and loving her precious Chihuahua “Angel”. Lynne was preceded in death by her husband Albert Vanderhoff and her parents. She is survived by her daughters Lisa Vanderhoff (Theresa) Sherry Vanderhoff, and Kimberly Clanton (Scott), her brother Wayne Hoel (Anita), her sister Doris Hoel (Jerry), and grandchildren Garrett Bourdon, Shawn Vaughn (Lowell), Kiley Hudson and Bryston Hudson. A service celebrating her life will be held Monday, April 8, 2019 at Pensacola Memorial Gardens Funeral Home. The family will receive friends for visitation from 1-2:00 PM. The funeral will begin at 2:00 PM with Rev. Glenn Vaughn officiating. Interment will follow in the Pensacola Memorial Gardens Cemetery. The Mary Belles Red Hats will miss our dear friend of many years. Prayers for the family. Lynn was a devout member of First Christian Church and was much loved. We will all miss her and remember her sweet demeanor and valuable role she played at First Christian. John and I are saddened to learn of Lynn’s passing. Our thoughts and prayers are with the family!